Situated in the central London neighbourhood of Oval (SW9), The Wren, our Shared Ownership development of 44 homes, is an inner-city sanctuary boasting green space, communal areas and outdoor seating. It’s central London location also means that The Wren is perfectly located for commuters looking to minimise their travel time. 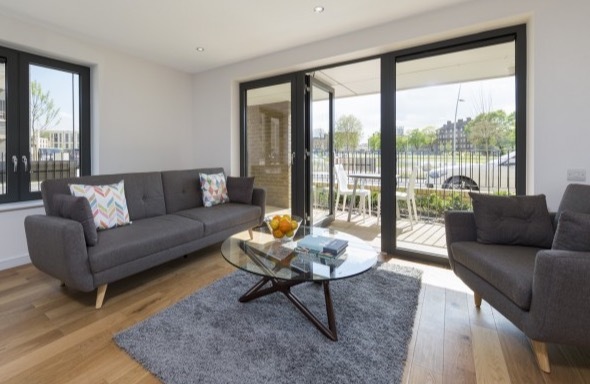 In addition to its prime location and peaceful surroundings, each of the apartments at The Wren is kitted out with a high quality interior specification. Each home features a high-gloss fitted kitchen in a neutral tone, complete with quality appliances and white goods – perfect whether you’re an aspirational chef or just knocking-up a quick bite. The bathroom features contemporary sanitary ware in white with chrome fittings, a steel enamel bath as well as a chrome finish shower head, mixer taps, shaver point and towel rail – as though you were bathing in a sophisticated hotel. Due to its fantastic location, spacious apartments, peaceful surroundings and high-spec interior, demand for properties at The Wren has been high. Unsurprisingly, there is now only one 2-bedroom apartment left available. To register your interest in the final home, contact one of our friendly sales team via email (sales@shgroup.org.uk), phone (0300 555 2171), or register your information on our website by clicking here. Are you looking for a modern home in Central London? Southern Home Ownership is proud to present The Wren; an impressive selection of one and two-bedroom apartments, available on a Shared Ownership basis. The Wren is situated close to Central London and conveniently located just a short walk from both Oval and Vauxhall tube stations. For more information and to register your interest, visit our website.